The average price of dwellings fell slightly by 0.35% during the year to Q3 2018, from meagre growths of 0.61% in Q2 2018, 0.31% in Q1 2018, 0.82% in Q4 2017, and 0.27% in Q3 2017. During the latest quarter, house prices dropped 0.82% in Q3 2018. Analysis: Demand falling, construction surging. One of the main reasons of the sluggish house price growth in Finland maybe the continued surge in construction activity despite falling demand. During the first ten months of 2018, total transactions of old dwellings fell by 9.4% y-o-y to 48,217 units, according to Statistics Finland. On the other hand, dwelling starts in residential buildings rose by 6.4% y-o-y to 35,700 units in the first nine months of of 2018 while completions were up by 19.6% to 29,626 units. 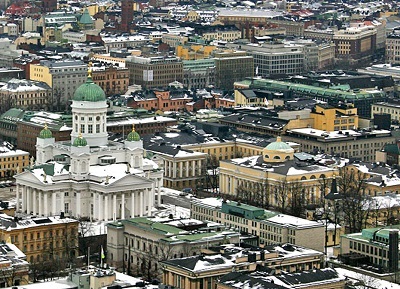 Finland has suffered several years of very low growth. At the heart of Finland's problems has been the inability of Nokia to compete. Between 1998 and 2007, Nokia was responsible for 20% of all of Finland’s exports; but by mid-2012 Nokia was almost bankrupt, and its contribution to Finnish GDP was actually negative. Over 40,000 highly-skilled Finnish ICT workers were unemployed. Aside from Nokia’s weakened activity, exports were plagued by the economic recession in Russia ― Finland’s major trading partner. However the economy is now gradually improving, with the unemployment rate falling to 6.3% in October 2018, from 7.3% a year earlier. Helsinki apartment costs are around €6,609 per sq. m.
Recent news. The economy is projected to expand by 2.6% this year, after growths of 2.8% in 2017, 2.5% in 2016, and 0.14% in 2015 and declines of 0.6% in 2014, 0.8% in 2013 and 1.4% in 2012, according to the IMF.